Alstroemeria Dancing Queen is a lovely bright orange variety. 80cm tall & wholesaled in 10 stem wraps. (Please note, alstroemeria flowers take a few days to open). Also known as the Peruvian Lily or Lily of The Incas, (or simply 'alstro' in the floristry trade), alstroemeria, was named for the Swedish Baron Clas Alstromer by his associate Carolus Linnaeus. Alstroemeria is commonly miss-spelt 'alstroemaria' & 'alstromaria'. 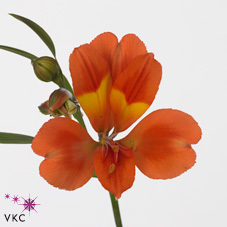 The flower is referred to as the Peruvian Lily as it resembles a miniature lily. (Alstoemeria is not a lily though). An unusual botanical fact about alstroemeria is that the leaves are 'resupinate' - meaning that they twist from the bottom, so what appears to be the upper leaf is in fact the lower leaf area.